The streaming service’s presence at the tour was genuinely impressive, with a series of shows whose teams — from “Catch-22” director George Clooney to “Shrill” executive producer Elizabeth Banks and actor Aidy Bryant to “The Act’s” Patricia Arquette and castmates to documentary subject Dr. Ruth Westheimer — provided not merely star power but real insight. 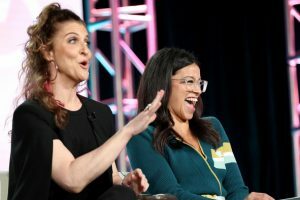 Major talent at TCA is nothing new, but the all-killer, no-filler nature of Hulu’s fast-moving of panels, along with the fact that the stars came with strong ideas and points to make indicated that a scrappy Hulu’s ambition, at least, is on par with its more dominant peers in the streaming space. FX head Landgraf lambasted Netflix’s self-reported non-Nielsen metrics as “myth”-making that misrepresents its hit-to-miss ratio. He touted FX’s success via a limited slate, but acknowledged it will ramp up output amid the integration of Fox into new parent Disney. The 2% year-over-year growth to 496 scripted original series in 2018 was fueled by major growth in online shows. “Broad City” and “Narcos” alum Castro had the unenviable task of closing out one of the longest days of the press tour to promote his new Comedy Central sketch show “Alternatino.” Castro, flying solo, injected some much-needed energy into the room and kept the journalists in attendance rolling with his rapid fire humor. NBC and CBS opted out of what was once the traditional executive despite each having undergone recent executive transitions worth engaging reporters about. (It has now been nearly two years since NBC presented an executive session at TCA.) But Fox and ABC were game. Recently installed ABC entertainment president Burke was candid about her goals, noting that ABC recently lost its title as America’s No. 1 network women, and declaring, “I am determined to get it back.” New Fox Entertainment CEO Collier, meanwhile, showed himself adept at playing to the TCA audience, recruiting actor Jonathan Banks — a favorite of critics — for an elaborate gag that demonstrated a willingness to be open and unstuffy with press. Desus Nice and the Kid Mero brought some much-needed laughs to room in talking up plans for their new weekly Showtime late-night series. They also delivered a dose of realism straight from da Bronx by explaining how they plan to make the show a zone that is truly spontaneous and devoid of pre-interview preparation for guests. Plus, the pair who made their name with a late-nighter on Viceland and on the Bodega Boys podcast instinctively developed the coolest possible way to call on TCA questioners, with smooth synchronized hand gestures that looked a lot like the press conference version of dabbing.